Microphone cables are vital components in all church sound systems. Almost all instruments, including mircophones, require a mic cable. Knowing the different parts of a cable will help you understand how to use them to your benefit. There are usually two different ends on a microphone cable. 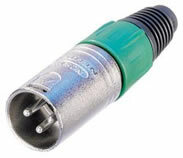 However, some custom or special cables can have two of the same ends for various purposes. The corded, lengthy part of the microphone cable has various forms of insulation and a core that sends the electrical signal through the cable. This insulation is used to protect the signals flow through the microphone cable and to ensure no cross-bleeding of other cables. The insulation is made up of basic non-static, clothe materials and some times polyethylene and polypropylene for lengthier cables. XLR-F is the end of the microphone cable that directly plugs into microphones, DI-boxes and other sound gathering sources. 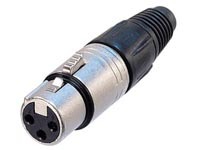 XLR-M is the opposite end of the mic cable that plugs into the snake or soundboard. You can use two cables to get your desired length by connecting the two different ends of two mic cables. However, this is not recommended because of generational audio loss.